Removes Biofilm & pathogens from all surfaces & hard to reach areas of pipework and within spas and whirlpool baths. Quick & easy to use, 100 times more effective in removal of biofilm than Chlorine - Cleans and disinfects. Each tablet generates Chlorine dioxide which is a soluble gas with the advantage that it penetrates through the biofilm and removes it. Chlorine can't do that because chlorine must oxidize through the biofilm first. Pure-Spa Power tab is about 100 times more effective in the removal of biofilm than chlorine. Biofilm is a habitat for dangerous pathogens such as Legionella, other bacteria and viruses.Without biofilm, chlorine consumption and the production of harmful disinfection by-products like trichloramine - responsible for the pungent chlorine smell in the air - will decrease. As a precautionary measure - Do not use in enclosed spaces, make sure there is good ventilation. Dosage: Add 1 x 25g for a Spa or Hot tub. Turn on the water massage system & if applicable the filter cycle. Leave running for 10-20 mins or filter cycle duration. Let the Pure-Spa power tab soak for an hour or two. Immediately after adding the tablet to the Spa/whirlpool you will notice the water will turn yellow as the tablet dissolves. This indicates the tablet is working and is oxidising the contaminants in the system. As soon as this color has completely disappeared, approximately after 1 hour, the water is crystal clear and completely disinfected. If it takes a long time for the water to go clear this usually means your spa is relatively clean so its nothing to worry about. Do not use the spa or bath during this time. After approx. one hour, completely drain the spa water, rinse and refill with fresh water. If necessary replace your filters too. Your spa is now free of biofilm. Repeat this treatment at least every 3 months. ways refer to the label/leaflet with instructions. As a precautionary measure - Do not use this product in enclosed spaces, make sure there is good ventilation. Place the tablet directly into the bath water & turn on the water massage system, leave running for 10-20 mins. Do not use the whirlpool bath during this time. After approx. one hour, completely drain the spa/whirlpool water, rinse and refill with fresh water. Your whirlpool/spa is now free of biofilm. Repeat this treatment as required or at least every 3 months. Care should be taken when draining the solution to a septic tank. Typical Levels of Chlorine Dioxide when 1 tablet is dissolved in 1250L water would be 1-2ppm. Chlorine dioxide may sound a lot like chlorine, but it is an altogether different chemical compound with the formula ClO2. Municipal authorities started using it to disinfect drinking water as early as 60 years ago. It is still widely used for this purpose today. And with good reason: chlorine dioxide is less corrosive than chlorine and superior for the control of legionella bacteria. 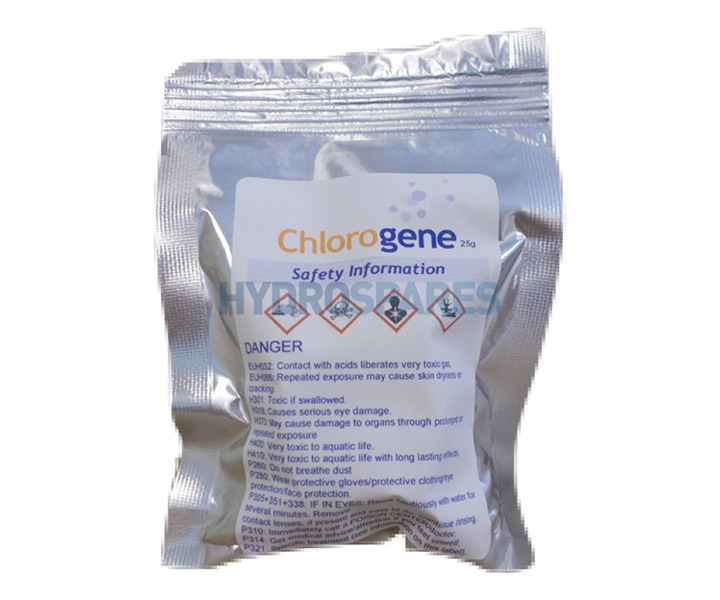 It is more effective as a disinfectant than chlorine in most circumstances against water borne pathogenic microbes such as viruses, bacteria and protozoa. Chlorine dioxide is also used as a disinfectant of medical equipment and for odour control. When used in spas, it is not only disinfecting the water, but also breaks down the biofilm that may form in the tubing system and which can act as a growing ground for micro-organisms. The particles that result from disintegrating the biofilm is filtered out by the spa filter system. Is it a problem when traces of other disinfection products are still in the spa water? No,as far as is known, the Pure-Spa Power Tab can be used even when traces of other disinfection product are in the water. Is the smell of the water, just after adding the tablet, toxic? No, the concentration is so little that inhaling does not endanger the health and the smell will disapear soon. Why has the water turned yellow? Immediately after adding the tablet to the spa the water will turn yellow because of the dissolving of the tablet. As soon as this color has completely dissapeared, approximately after 1 hour, the water is crystal clear and completely disinfected. I have read that the water turns transparent again after approximately 1 hour but in my spa it took much longer. How is that possible?The water in your spa already was very clean. The coloring that occurs will disappear as the product does its job. The product will be used when in action. Since the spa water was very clean already the product has little to do so it takes longer for the color to disappear. Nothing to worry about. Your advice is to use 10grs per 1,250 liters of spa water. What to do when my spa contains 1,500 liters? Just use a 25grs tablet. When in doubt, always use a slightly higher dose than recommended. Since chlorine dioxide disappears rapidly after disinfecting, there is absolutely no problem using more than the recommended amount. A lot of filth appeared in my spa? How can that happen? It is clear that the Pure-Spa Power Tab did the job. The filth has come out of the tubing of the spa since the product obviously detached the biofilm. The pipes and tubes contained dirt which has come off now, into the spa. The filter will catch these contaminants. You should completely drain the spa water, rinse and refill with fresh water. If necessary replace your filters too. Can Pure-Spa Power Tab be used in combination with the ozonator and the UV-lamp of the spa? Yes, Pure-Spa Power Tab can be used with ozon and UV without any problem. The UV will however reduce the effectiveness of Pure-Spa Power Tab..
How fast is the Pure-Spa power tab at disinfecting water? Within a couple of minutes all bacteria are killed. Chlorine takes much longer to be effective. What is the shelf life of Pure-Spa Power Tab? The products is guaranteed effective for 2 years. Risk of serious damage to eyes. In case of contact with eyes, rinse immediately with plenty of water and seek medical advice. Wear suitable protective clothing, gloves and eye/face protection. Toxic in contact with skin. Keep away from heat. - No smoking. Keep away from clothing, incompatible materials and combustible materials. Dispose of contents and container national and international regulations. Having used another companies product since our spa bath was installed, I was surprised to notice a build up of black bits, after our bath wasn’t used for 2 months, due to being away. I continued to use the product we had used before, but it just wasn’t tackling the problem. I researched the Internet and found this Biofilm Eliminator Tab, and boy did it do the trick, the slime that came out of the pipes was amazing. We have since gone over fully to Pure-Spar products, and as of yet, the black bits haven’t come back. 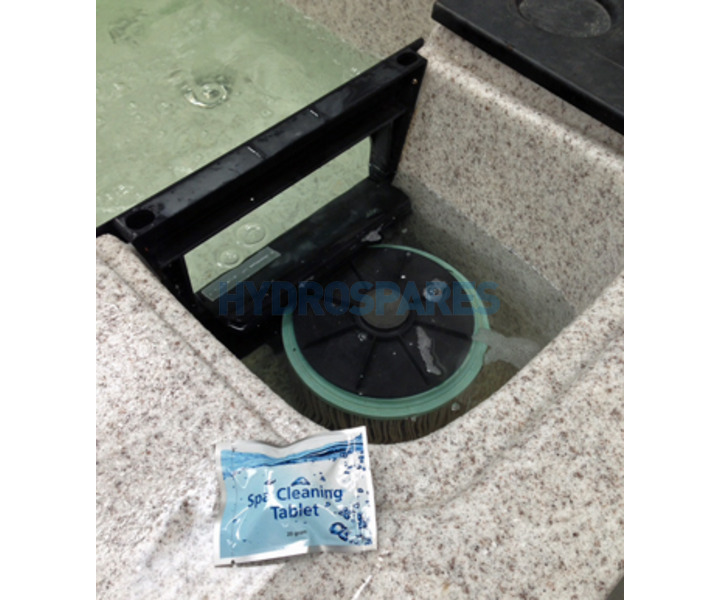 This was the first time that I had used one of these 10g tablets on my whirlpool bath. I was amazed by just how much of this bio-film appeared during the cleaning process. I will be using one of these every six months from now on, in addition to the usua, after each bath, tablet I use. Thank you for your review Phillip! I am using these for a whirlpool. I am very happy with the result. They seem to do the job very well. I have used these tablets since they first came onto the market after having used the Spa100 which is in liquid form and basically the same compound but in tablet form. I found they are easy to use, just pop them in and presto after around an hour it is ready to use. Hydrospares sell them at a reasonable price and that is the reason why I have purchased them on two occasions and will continue to buy from again. Received this product recently and have used it. Very impressed so far with it. Also had a few other products and very pleased with these as well. Can you advise if this product and the cleanser/degreaser are both suitable for my air bath? We have a phantom whirlpool bath as advertised on the better bathrooms website. If not can you please recommend what we should use? Thank you. should it be used with hot or cold water? Hello, thanks for your question. Its fine to use with either warm or cold water. Do you leave the whirlpool running whilst this tablet is in the water, or do an occasional on/off? Its most effective if the water is circulating through the pipes, but it will still work at oxidising the contaminents in the system if you were to run the jets for a while then turn them on & off occassionally. Hello, Yes each tablet is individually wrapped in foil. We sell them as singles or in packs of 12. There are two sizes 10g or 20g. The price is before any discounts. Please see listing for full user instructions.